Law enforcement officers remove more than a dozen protesters from a hallway outside the governor's office Monday, June 4, 2018. Gov. 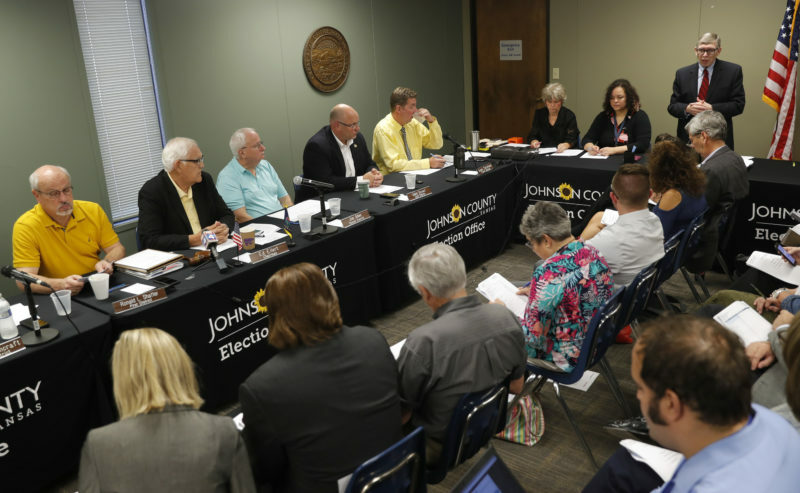 Jeff Colyer was not in the building and the door to his ceremonial office was locked. The protesters were part of the Poor People's Campaign, a group that has been staging demonstrations in state capitals around the country for four weeks. 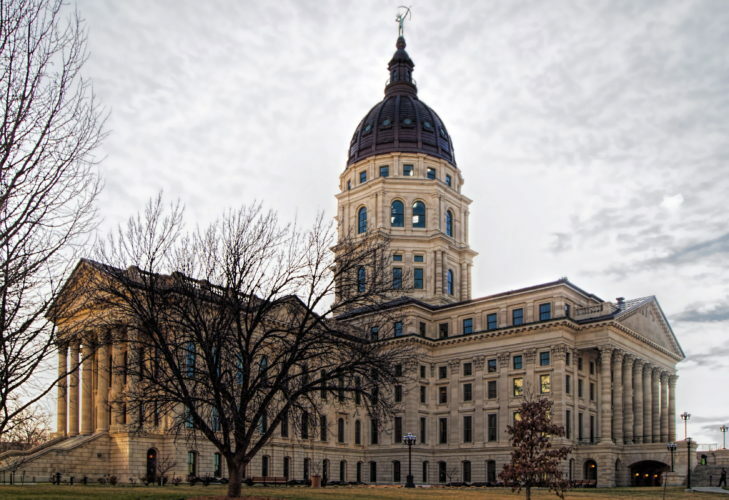 Sixteen protesters were arrested and removed from the Kansas Statehouse in handcuffs Monday for gathering outside Gov. Jeff Colyer’s office, chanting and singing protest songs. Colyer was not in the building at the time, and the doors to his office were locked. The protest was part of the Poor People’s Campaign, which has been staging demonstrations in capital cities around the country for the last few weeks, trying to raise awareness about poverty, health care, social justice, the environment and a host of other issues. The organization says it is planning more protests each of the next two weeks. 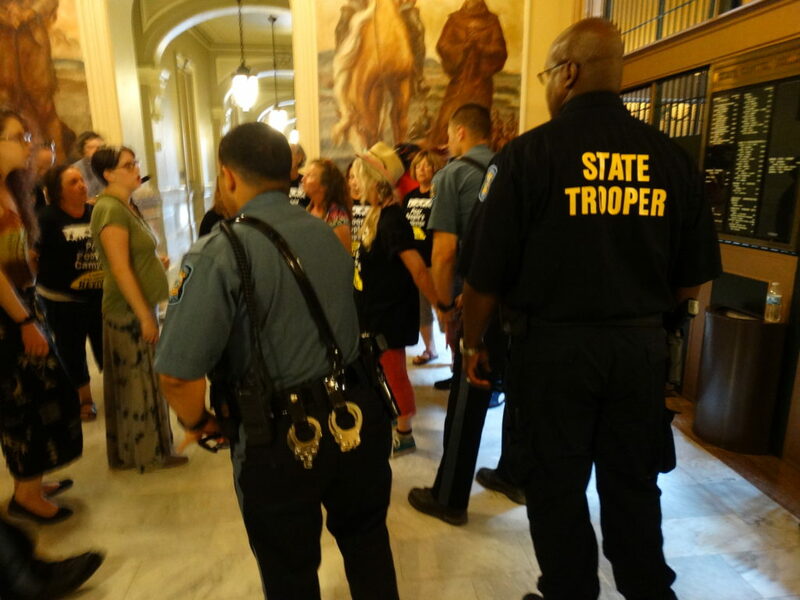 In Kansas over the previous three weeks, Poor People’s Campaign protesters have been arrested for blocking a street in downtown Topeka, for occupying a room in Secretary of State Kris Kobach’s office, and for protesting outside the offices of the Kansas Chamber. At Monday’s demonstration, around 60 people gathered in the second floor rotunda of the Statehouse around 2 p.m. for a rally where a number of speakers talked about this week’s focus of the campaign, health care, including support for expanding the state’s Medicaid program, and environmental hazards. Statehouse officials said the group had a permit to use that space for a rally that would last until about 4 p.m.
Around 2:45 p.m., however, the group began marching toward the governor’s office, just east of the rotunda. When members found the door closed and locked, they stayed in the hallway, singing protest songs and chanting slogans. Many of them sat down in front of the door. 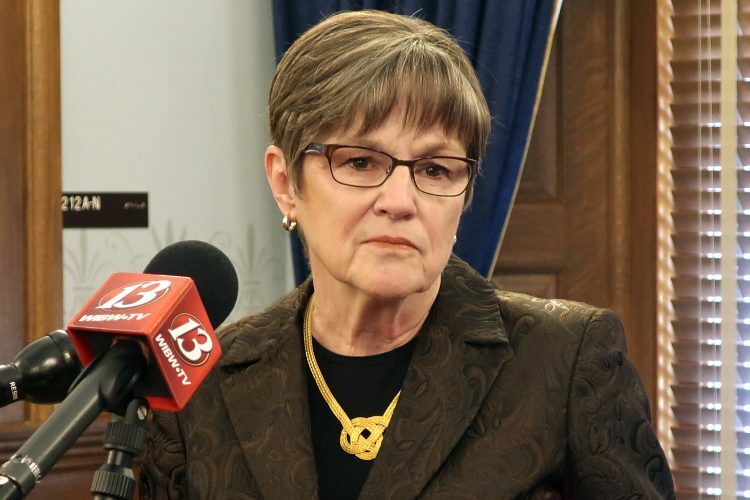 Shortly after 3 p.m., an announcement came over a loud speaker system in the Statehouse saying the permit had been canceled, and the protesters were given five minutes to leave. Most of the protesters returned to the rotunda area before the five minutes expired, but a group of 16 remained seated on the floor outside the governor’s office until they were physically removed, most being restrained in zip ties or handcuffs. 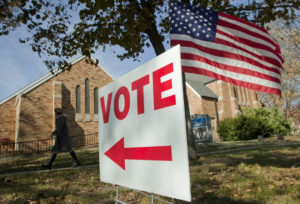 “They were upset with us for singing,” said Thea Perry, from Tonganoxie, another protester and a Democratic candidate for the 42nd District House seat. Both Durell and Perry left the hallway before the warning expired and were not among those arrested. Colyer’s office responded to the protests by issuing a statement. 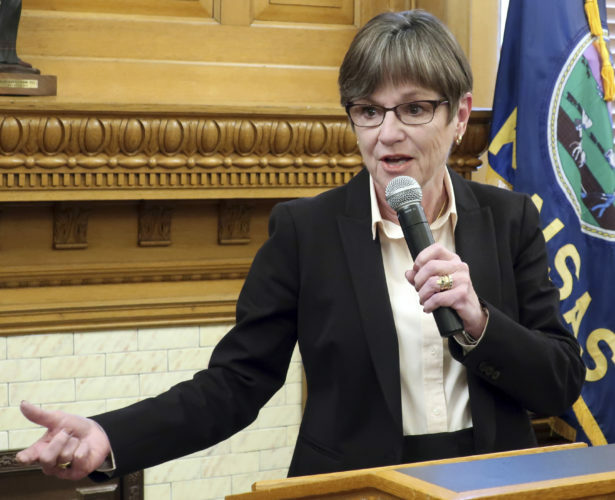 “Governor Colyer appreciates the advocacy of the protestors today, however he continues to support work requirements for able-bodied adults on government welfare programs and opposes the expansion of Obamacare in Kansas,” the statement said. Capitol Police Lt. Terry Golightley said in a phone interview that the protesters were removed for violating the terms of their permit, which restricted them to the rotunda area of the second floor. A subsequent news release from the Capitol Police said the 16 individuals were charged with criminal trespass, a misdemeanor. They were booked into the Shawnee County Department of Corrections.